to stay updated on the latest catch available. Intimidated by the head, bones and a perception of complicated rules and techniques many people shy away from cooking fish at home. Follow these few easy steps and you’ll forever be spoilt and never again settle for less than super fresh fish cooked to perfection. Most important in preparing a delicious fish dish is that your fish is very fresh. When purchasing whole fish, the eyes must be clear, the gills – just below the head – must be bright red and the scales must be shiny and plentiful. When purchasing filleted fish the best way to check for freshness is to smell it. Get up close and take a big whiff – the fish should smell oceany but never fishy. The flesh should be translucent and resilient. White fish has a pinkish tinge to the flesh. Tuna should be reddish and not brown. Get up close and personal with your fish when looking for the freshest catch. It’s usually the freshness which affects the quality but poor handling of fresh fish is also a problem as it can damage the flesh. 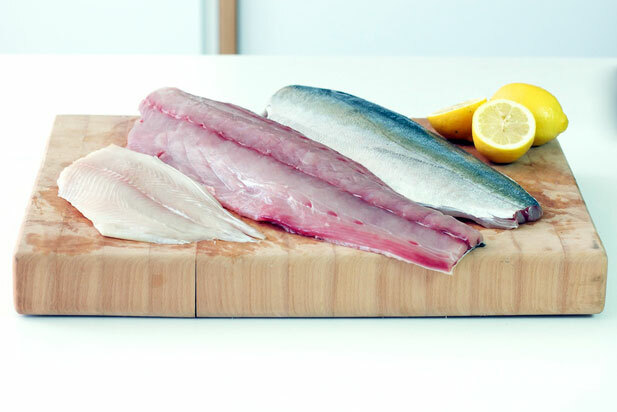 Always check that the fish is not soft – whole fish and fillets should be firm. There must be no obvious damage like bite marks (from sharks and seals) and check that flesh and skin is not broken. If the fish is vacuum packed the packaging must be sealed to prevent contamination. Good quality fresh fish should keep in your fridge for 2-3 days after purchase – but it’s always better to eat on the day of purchase. Store the sealed fish in the coldest part of your fridge. Remove the fish fillets from the packaging a few hours before cooking, rinse off to get rid of any loose scales, pat dry and leave in the fridge uncovered in an oven tray until cooking time. No one likes a mouth full of bones. 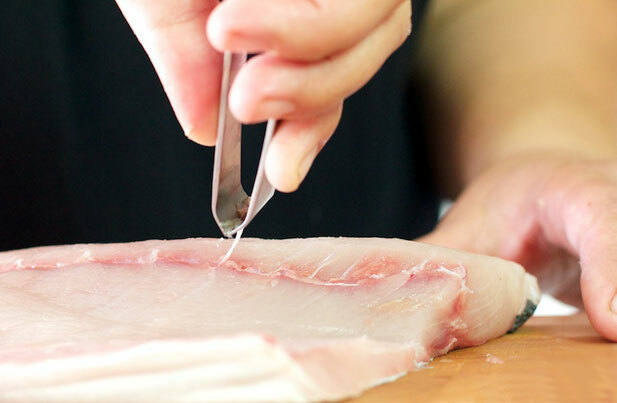 Ask your fish monger to fillet the fish away from the belly bones, otherwise slide a filleting knife under each bone to remove. 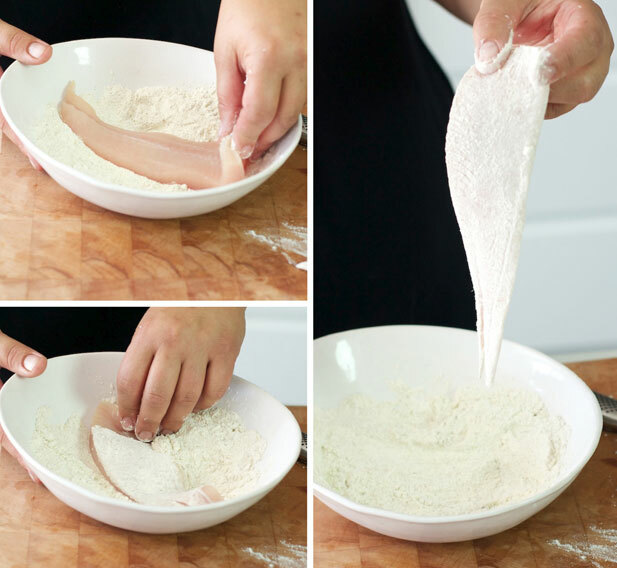 Once done there’ll only be a row of bones running roughly down the center of the fillet of fish to about the halfway mark – remove these with fish tweezers or cut the bony strip out or when serving the fish pull the flesh away from the bones. I always reserve the tail half of the fish for youngsters as there are no bones. Now we get to tips for cooking the fish. The most important principles are simply never to over cook or over flavour fish. 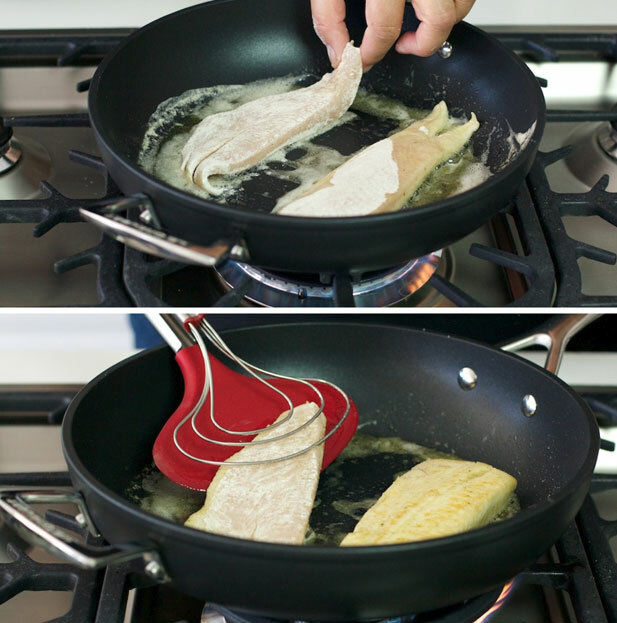 When frying a fillet of fish always be sure to preheat the pan as it prevents the fish from sticking to the pan. It’s best to use a combination of oil and butter (butter for flavour and oil to prevent the butter from burning). Dust the fish with seasoned flour (literally flour with some salt, pepper and spices) and you’re ready to fry. In general fish takes about 5 minutes for every centimeter of thickness to cook but check before the estimated time of cooking is finished to prevent overcooking. I usually remove my fish just before it’s actually cooked and allow it to stand for a few minutes. Fry the side that you’ll present first, this could be the skin side or flesh side depending on your preference. Finish the cooking on the other side. Tuna is a little different in that you should use a very hot pan and it’s best to only sear the outside of the fish. The middle should be a lovely reddish pink colour. Everyone loves fish and chips but to get the same results at home is not easy. For crispy batter that doesn’t soak up oil, try soda water or beer instead of milk or water in your recipe – and make sure the batter is icy cold. Use a deep fat fryer if you have one, as you can be sure of your temperature. Otherwise test the oil with a cube of bread, it should be at 180C , the perfect frying temperature, when the cube browns in 60 seconds. Battered fish will be cooked when the batter is golden brown and crisp. Whole fish is great to braai in a foil parcel but fillets are delicious on the open fire. Use a sandwich grid that folds closed and can be turned. Make sure the grid is clean and well-oiled to prevent sticking. 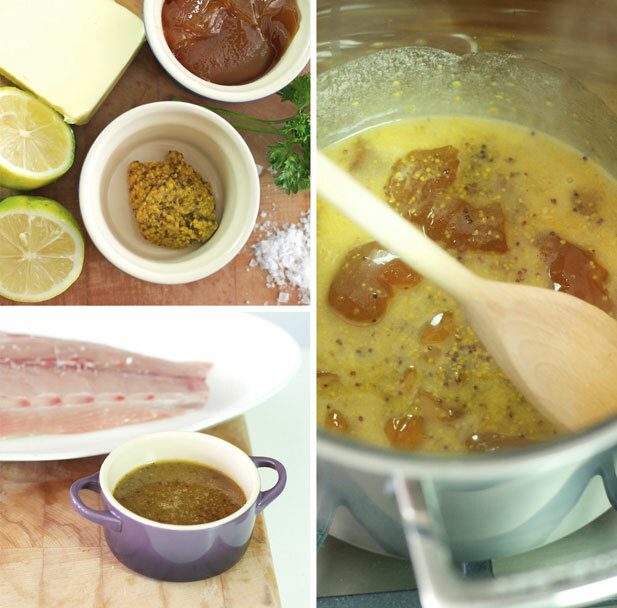 Baste the fish regularly with melted butter or a basting sauce. Braai the flesh side first until you have a great golden colour then turn over and cook until done. As with baking and frying, check for doneness with the point of a knife. If you can, remove from the fire just before the fish is cooked to prevent drying out. Tuna is awesome on the fire – marinate thick steaks (2-3cm) in soya and ginger and braai in a well-greased, ‘sandwich’ braai grid over hot coals for about 1-2 minutes a side. You’ll see the fish change colour on the sides. Remove from the grid and slice. Add a dash of soya, some coriander, and a little wasabi (or wasabi mayo). Your family and guests will be blown away. Never overdo the flavour but do experiment with different combinations. The most popular no brainer is butter, salt and lemon but typically Asian flavours also work well – try basting fish with Soya, chili and coriander. Indian spices are great and compliment fish as do the Garlic and tomato combination of the French bouillabaisse. Always buy fish from a reputable fishmonger or deli. Ask questions about where the fish comes from, how it was caught, their cooking recommendations and whether the fish is previously frozen. Take into consideration the SASSI species list when buying – this ensures a guilt free dinner. Download print-friendly version of this article. 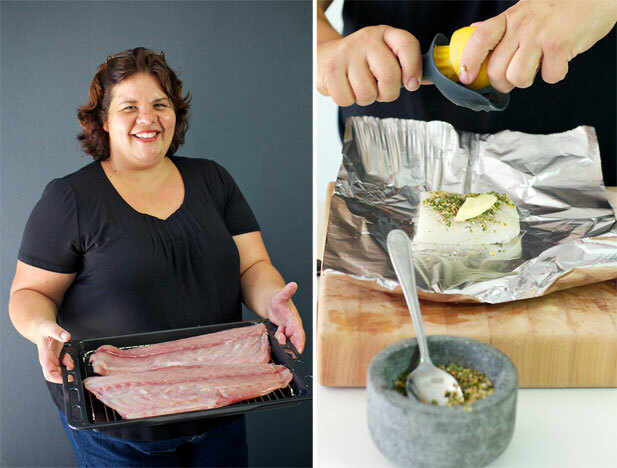 For SA home dining, Julie recommends Angelfish, Yellowtail, Gurnard. Hake and Longfin Tuna. If you enjoyed these tips, get hold of some fresh fish, put them into practice and let us know how it goes.